Conor Oberst | Gary Burden for R. Twerk & Co. I met Conor Oberst at Neil Young’s Bridge School Benefit a few years ago when his band, Bright Eyes, played the show. We instantly became friends and formed a bond that continues to grow stronger every day. In spite of Conor’s rigorous touring and my work schedule we have managed to spend a lot of time hanging out together. 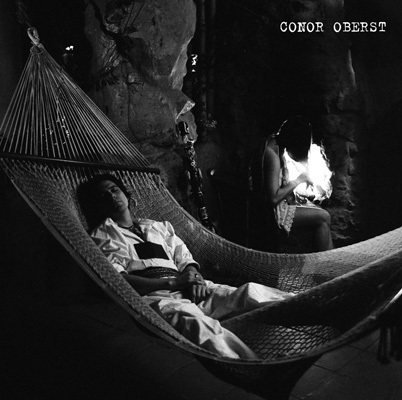 In 2008 Conor decided to make his first solo record under his own name and surprisingly wanted to use an image of himself on the cover, a first for him. He invited me to make the cover art and I leapt at the chance to collaborate. Conor had found Tepotzlan, an amazing little ancient Aztec village an hour west of Mexico City built around a small pyramid above the center of town. He rented a gated resort complex called Valle Mistico (Mystic valley), shipped in recording equipment and flew in the band and an engineer/musician. Everyone stayed in separate little casas, one of which was set up as the recording studio, they ate breakfast, lunch and dinner together every day and usually had some great adventure during the day with the night filled with making and recording music, cerveza and swinging in a hammock under the stars. In the process Conor and the band made a great record that has a lot of these experience in the songs. I got to photograph it all. At Conor’s insistence I had agreed to take the photos myself for this package. This is something I had judicially avoided doing for forty years. I always had the vision of what I was going to make for the cover art and I first drew and figured it all out on paper. But when it came to realizing the image I was so intimidated by the camera that I hired photographers to do that part of the job and then I art directed everything; found the locations, put together wardrobe and directed the artists to realize the vision we had worked out beforehand. This time I was going to be responsible for all of it, including shooting the pictures. My wife and I flew into Mexico City, were picked up by Conor and spent the next ten days hanging out, listening to great music being made and shooting photos all day. I had an idea of what I wanted to present Conor with and actually being there in Mexico was confirmation of how cool it would be. I was going for a “Viva Zapata” peon look. My wife and I scoured the little village of Tepotzlan looking for funky white muslin pants and shirts and authentic hats and sashes for Conor and the members of the band. Miraculously we found everything we needed in the living room of a little old lady who supplied costumes for native Indian dance performances. Genuine authentic outfits that had a lot of history and magical energies woven into the warp and woof of the antique garments. The actual cover photo was taken late at night on the porch of a casa, in the dark using the firelight and bouncing it with sheets of aluminum foil onto Conor lying in a hammock. Technology made it possible for me to rent a 35mm film camera and lenses that were so automatic that it made me look like I knew what I was doing. It was very satisfying to be able to look through the lens and compose the moment myself. After getting home and seeing the images and how well things had turned out I was inspired and went out and bought the exact same camera and lens outfit. Now there need never again be any middleman between my vision and the final image. Thanks Conor.